In the article about Modifying Data Server-Side, we gave a brief list of the steps that every bit of data has to go through before your friendly marketer will see it in her reports. Let’s expand on that and also mention the different points where you can add information or retrieve it. Let’s start in your realm, the page or app. This is where you primarily enter information into Adobe Analytics. You “capture” data. The next step is for the core code to call the s.doPlugins callback which allows you to automate things that should happen on every hit. The data is eventually being sent to “the cloud”. To be exact, it goes to one of the collection servers somewhere in the world. At this point, you can very easily see what happens, which makes this the perfect spot to debug by looking at the URL (do I have to repeat that I use Charles for that? Or did I mention that before?). This is where your — the developer’s — involvement with putting data into the system usually stops. But don’t stop reading, because it makes sense for you to know how your marketer can influence & change (and potentially mess up!) data later. There will also be some points where you can get data out of the system for further use, and your friendly marketer might ask you to do that. There is actually more to it. At this point the data in the hit has been modified to an extent, but the view is still hit-based, i.e. so far the system hasn’t applied any prior knowlege. The upcoming “Firehose” feature that allows you to receive raw hit data in realtime sits at this point. In other words: Firehose will give you a stream of hit-level data that has gone through all the steps we have seen so far. System applies the “Visitor Profile”, which basically means it adds data it collected in the past, like eVar values. The visitor profile is matched based on the “visitor ID“. So right now the hits have been enriched with data that is tied to the visitor via the visitor ID. This is the point where data gets split: it goes into Data Warehouse (which means that Data Feeds contain what we have now), plus it is sent into a further processing queue for Adobe Analytics. The reports that your friendly marketer pulls are like a pre-defined view on aspects of the data that you have sent into the system. They are designed to help her find answers and make decisions. And there is one more thing that we need to mention, one more thing you can do to help her: you can use the Reporting API to pull data for her, and you can make fancy displays or dashboards for her. 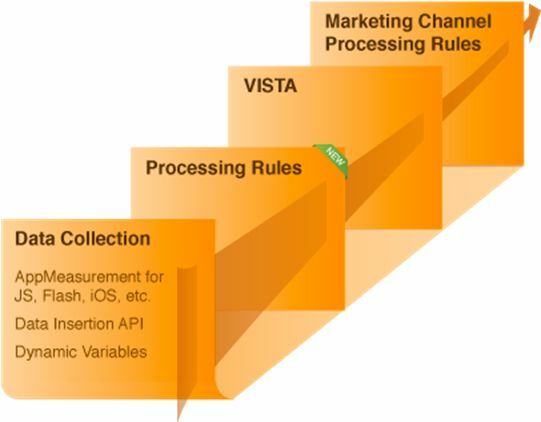 The data that you pull out of the Reporting API has gone through all 12 steps. Don’t forget to use the all new version 1.4 for added goodness. If you are at the EMEA Summit in London in two weeks, you might want to come and see Bret Gundersen and myself at 11.20 on Thursday when we’ll talk about Processing Rules. Bret will also show a slide that’ll sum up a lot of what I wrote above.